Chaplain of Florida is a non for profit organization and a division within Central Christian University to provide certification in the areas of chaplaincy. Chaplain certification means that the applicant has fulfilled all of the class and clinical requirements for certification. The work of the chaplain differs greatly from the work of the pastorate. The pastor cares for the spiritual needs of the congregation; whereas, the chaplain must care for the needs of the secular world as well. There are several fields of chaplaincy, some of which are easily recognized. Some chaplaincy areas of note are, police, fire, hospital, jail, industrial, transportation, search & rescue, sports, collegiate, hospice, nursing home, motor cycle, and the list goes on. All are valid in scope and design. All need education, credentials & guidance to do the work their hearts desire. Contribute to the integral development of society by providing the highest pastoral clinical training and training to chaplains, counselors, professionals, who will efficiently function as agents of change in national, regional, governmental and private institutions. To promote the training of men and women in the field of pastoral care and professional counseling as well as to promote the profession of chaplaincy and counseling as disciplines committed to the integral well-being of human beings. 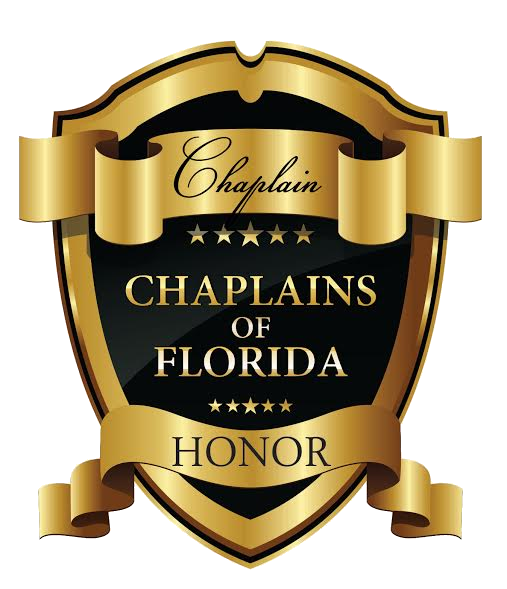 Chaplains of Florida offer National membership for residents within the United States, International Membership and for any ministry that so wish.